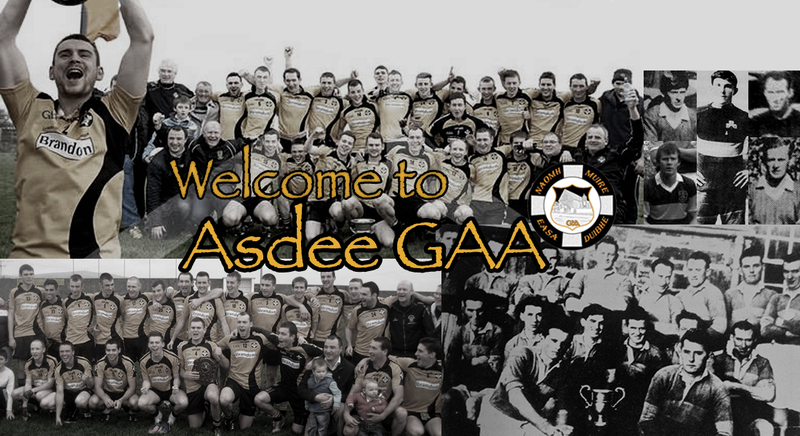 Asdee entered this game on the back of a Novice Shield triumph over neighbours Ballylongford the previous Sunday but were always going to find the going more difficult against one of the favourites for this years championship. Beale got off the mark quickly with points in the 2nd and 4th minutes. A high ball was delivered into the Asdee square in the 7th minute with full-forward Barry O’Mahoney narrowly beating the keeper to the ball and managed to palm the ball into Asdee goal before colliding with Conor Coughlan. Both players needed treatment after the collision but thankfully were able to remain on the field. Unfortunately for Asdee their corner-back Tom Mulvihill had to leave the field a minute after the goal due to an injury. Beale added another point in 10th minute and now led by the scoreline of Beale 1-03 Asdee 0-00. After a similarly bad start last week John Kennedys men rallied and got back into the game. Asdee can be proud that they once more managed a brave fightback to keep themselves in contention at half-time. Con Carmody won the ball thirty metres from goal and managed to beat his marker before firing over Asdees first point of the game. Two minutes later Mike Tydings got on the end of a great pass to coolly slot over to leave the score Beale 1-03 Asdee 0-02. Darren Russell responded to another Beale point before Asdee won a free forty meters out from the Beale goal. Darren Russell dropped the ball into the square and Asdees Noel Long rose highest to fist the ball low to the right hand corner of the goal. However, on this occaission Sean Dee managed to get down brilliantly to save what looked like a certain goal. Beales James McMahon restored the seasiders advantage to five points with a wonderful curling effort from thirty yards out in the 26th minute before Eoin Kennedy rounded off the first half scoring with a close in free in the 28th minute. After a slow start Asdee had battled back into contention with Darren Russell, Noel Long, Con Carmody, Eoin O’ Carroll and Sean Keane leading by example. The infamous “six day turnaround” has been much talked about in the recent All-Ireland football championships. Time and again teams have not been able to match the intensity they showed six days earlier having been physically drained in a hard fought championship match. Unfortunately for Asdee, this theory definitley applied in Ballylongford in the second half on Saturday with the team being unable to match the standards set in their performance last week. Their brave 1st half fightback had empited the tank and Beale came out of the traps flying racking up three points within five minutes of the restart. Asdee were not helped by the fact that Michael Tydings, one of their star men the previous Sunday, had to leave the field in the 3rd minute due to an injury he brought into the game. Charlie Dalton got Asdees first score of the half in the 8th minute before Sean Keane replied to a Beale point in the 13th minute. Eoin Kennedy had a possible claim for a penalty waved away by the referee. However, after that Beale started to run away with the game with a number of impressive points, the pick of which was Andy O’ Connells brilliant effort. With ten minutes remaining 17 year old Eoin Tydings caught a great ball and was clear through on goal only to be fouled and referee Brendan Griffin had no hesitation in pointing to the spot. Darren Russell sent Beale keeper Sean Dee the wrong way to rattle the net. John Doran added a point a minute later to leave the score Beale 1-12 Asdee 1-07 in the 24th minute. Beale regained composure to score the last three points of the game to run out winners on a scoreline of Beale 1-15 Asdee 1-07. Asdee battled hard on the day and maybe the benefit of an extra weeks rest would have meant a closer game. However, there is a reason why Beale reached the last two North Kerry finals and when they play as well as they did last Saturday they are few teams in the division that can match them.